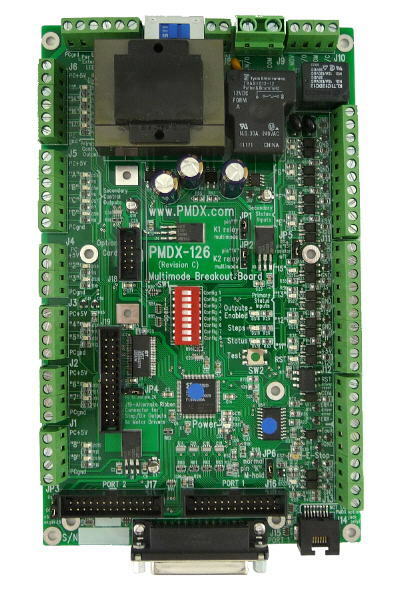 PMDX-126 board pictured as delivered. PMDX-126 pictured with PMDX-107, SmoothStepper, and cables. 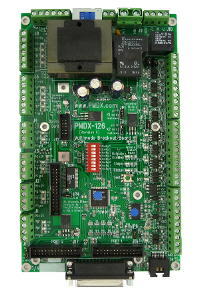 The PMDX-126 is a motion control breakout board for interfacing with the parallel port(s) of an IBM-PC style computer or to the USB or Ethernet Smooth-Stepper. Separate and fully isolated Error and Reset terminals for servo drives now work with almost all industrial servo drivers as well as the Geckodrive G320X. Revision C can still be used as direct electrical and mechanical replacement for revision A or revision B versions of the PMDX-126 board. Added hardware to slave a second motor for driving tandem axis configurations. This together with Jumbo mode makes it possible to drive up to 6 motors with one parallel port. One additional input available as pin 10 of 2nd parallel port (can be a general purpose input or act as "Machine Hold"). A total of 10 inputs are now supported. NEW feature - Inputs can now accept 24 volt PNP sensor signals directly. Many commercial routers and other machines that are upgrade candidates were originally delivered with PNP proximity sensors and this feature makes it much simpler to upgrade them. No external resistors are required. The inputs still directly support NPN sensors, electro-mechanical switches, and logic signals without external resistors or power sources being needed. NEW feature - Touch probe signal merge feature allows an active high digitizing probe and an active low tool touch-off probe signal to be combined into a single "probe" signal presented to Mach or other CNC software. No more needing to juggle software configuration based on the task at hand. Designed to work well with the probing features in the new MSM (MachStdMill) screen set. NEW feature - K2 relay can be reassigned to pin 14 of port 2 so it can be used even when pin 14 of port 1 is needed as the direction control bit for a PMDX-106 or PMDX-107. NEW feature - Option card slot improvements to allow new types of add-on interfaces in the future. Connects to host using a two parallel ports or a single parallel port when using expanded I/O modes. A DB-25 female connector is available for the first parallel port. 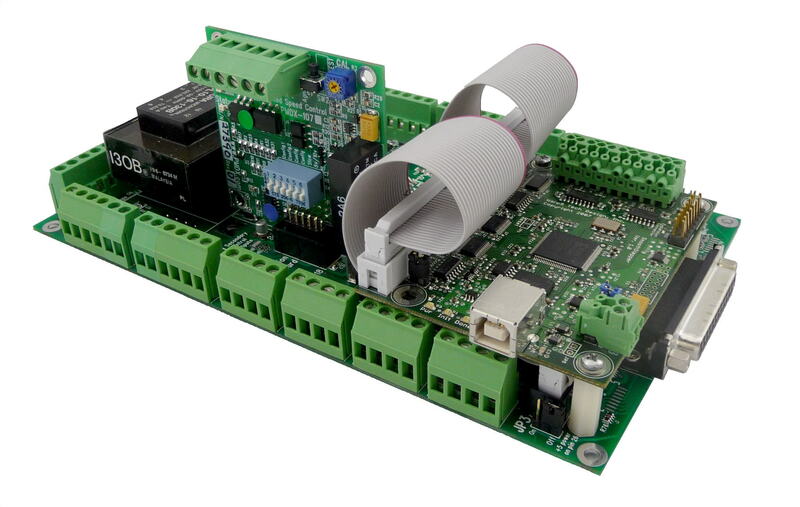 Additional 26 pin ribbon headers support use of a second parallel port or direct connection to a SmoothStepper. The second port supports 4 input and 4 output signals. 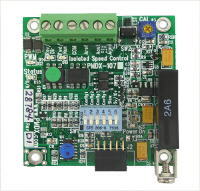 The remaining 8 data bits of the second port can be supported as input or output by adding a PMDX-108-Input or PMDX-108-Output board. The special isolated interface for error sense and reset can also work with many brands of servo drivers other than Gecko. (revision 1.9, 27 Nov 2013, 381 KB for Rev C boards only). (for manuals for rev B and rev A boards, see the User's Manual Archive page. Click here for application notes on using the PMDX-126. Download the Mach3 Plug-In driver for the PMDX-126 here. 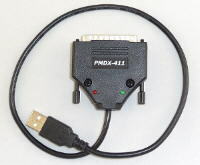 Note: Due to the many possible combinations of connecting the PMDX-126, no cables are included. If you are using a SmoothStepper, you may want to order 2 each PMDX-HDR26Ribbon cables. If you plan to use a single shared parallel port, you may want to order 1 each PMDX-DB25MtoM cable. If you plan to use two standard parallel ports, you may want to order 1 each PMDX-DB25Ribbon cable, and 2 each PMDX-DB25MtoM cables.